Classic yet contemporary American cuisine supported by warm, professional service. About the restaurant: When Nikolai's Roof launched in 1976 it served Russian-influenced cuisine, but the restaurant has long since dropped that focus, although a few dishes from those days remain, albeit reinterpreted and given modern heft. 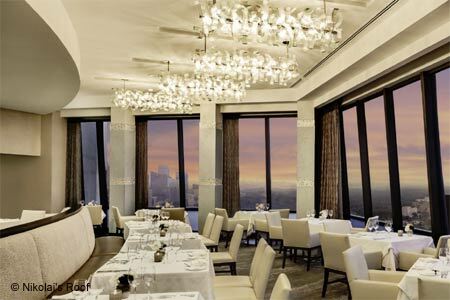 The stunning views of the city from the 30th floor of the Hilton Atlanta are complemented by glass ribbon chandeliers and a gray-and-cream color scheme. Food & Drinks: Chef de cuisine Stephanie Alderete's contemporary fare may be enjoyed à la carte or in three-, four- or five-course options. Add an ounce of caviar if throwing cost to the wine. The original Russian theme is reprised in a pair of piroshkis, pastry purses stuffed with braised beef, pineapple and red bell peppers, accompanied by béarnaise sauce. We like the gossamer light beef and beet consommé, the chef's rendering of borscht in a version that is elegant and not at all rustic. For a group dinner, Alderete can turn out a lovely version of a Russian classic, veal Pozharsky. Otherwise, mains range from inventive seafood fare to game, the latter especially in winter. The longtime signature dessert is the soufflé, another holdover from the old days. You will want to request it when you order your dinner so the kitchen can time its arrival for the end of the meal. The wine list is one of the city's most extensive, so peruse it at leisure to find an appropriate selection, or ask the manager, Daniel Rudiger, for his expert input. On Thursdays, guests can partake in flights of lemon- or green peppercorn-infused vodkas.